Apple’s new LED Cinema Display is the company’s first display designed specifically for use with its laptop line. The new display looks a lot like a 24-inch iMac ( ), minus an inch or so of thickness and the few inches below the iMac’s screen. It’s a bright and glossy-screened LCD that has some very appealing features, but a very limited list of supported Macs. It’s been more than four years since Apple revealed its last desktop monitor, the 30-inch Cinema HD Display ( ). 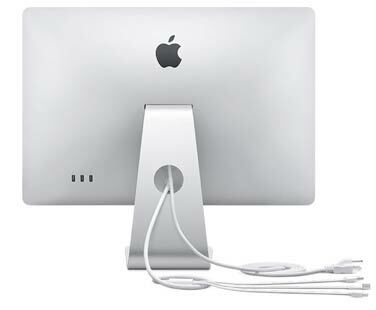 The 30-inch, introduced in June 2004 along with smaller 20- ( ) and 23-inch ( ) models, marked the end of Apple’s use of its proprietary Apple Display Connector (ADC) in favor of the industry standard DVI connection. The new LED Cinema Display introduces quite a few new technologies to Apple’s display lineup, the most controversial of which is a connector that at this point appears unique to Apple, the Mini DisplayPort (Mini DisplayPort is based on DisplayPort technology developed by VESA). As of December 2008, the only computers that can be used with the display are the current 15-inch MacBook Pros ( ), the new aluminum MacBooks ( ), and the current MacBook Air ( ). Apple has said that all future Mac products will include Mini DisplayPort support, and converting cables and boxes may be in the offing. But in the meantime, this new monitor has a very limited audience. Other new features include an LED backlight that is mercury free, warms up faster, and may last longer than the CCFL backlights found in most LCD monitors. A single three-headed cable is permanently attached to the display, providing power to your laptop via a universal MagSafe power plug, video signal through the Mini DisplayPort, and a three-port USB 2.0 hub. A permanently attached cable provides Mini DisplayPort, USB, and MagSafe power connectors. The new display also includes an iSight camera and microphone, and what Apple says is a 2.1 stereo speaker system which includes two speakers on the bottom of the display and a third, rear facing speaker on the back of the display that bounces the sound off of the stand and back towards the user. The sound quality of the display’s integrated speakers is much better than the speakers built into the MacBooks, but sounds tinny and lacking in bass when compared to the iMac’s built-in speakers. The screen specifications are fairly standard for a 24-inch LCD, with 320 nits of brightness, a 1000:1 contrast ratio, 178 degree viewing angle, and 14ms average response time. The glossy screen can help give depth to images onscreen, but it can also be very distracting to some. If you are sensitive to glare, be warned that this display is very glossy, turning into something of a black mirror when powered off. We looked at numerous different test files on the LED Cinema Display and found that it had an excellent viewing angle, with little or no color shift when viewed from virtually any vantage point. Gradients appeared smooth, and text was sharp and legible even at very small point sizes. Except for the very extreme edges and corners, color uniformity was excellent across the screen. I wasn’t able to find dead or stuck pixels on the screen. When viewing a full black screen, there appeared to be some minor light leakage from the bottom of the screen, keeping the display from looking as dark as LaCie’s 324 ( ). The display was a little overly bright and cool, with whites having a subtle bluish hue. The LED Cinema Display benefited from calibration with our Eye-One Display 2, which measured the display’s default color temperature at 6700K. 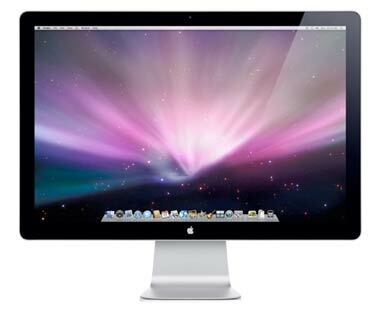 We’ve seen displays with faster response times that the LED Cinema Display’s 14ms. But we had no issues when watching movies or playing games. I have two pet peeves with the LED Cinema Display (and Apple displays in general), and they both have to do with customization. First, the stand only allows you to tilt the display. I can live without rotating and swiveling, but I do think that height adjustment is a key feature-who wants to shove books, reams of paper, or inelegant risers underneath a $899 display? My second beef has to do with adjusting the screen settings. The display has no buttons on it, but a brightness slider is available from your Mac keyboard. Changing anything else requires squinting your way through the calibration process in System Preferences -> Displays . The LED Cinema Display represents many firsts for Apple: the company’s first LED backlit stand-alone display, the first external display designed specifically for Apple laptops, and the first Apple monitor to sport the new Mini DisplayPort connection. Its lack of compatibility with other Macs and its lack of customization settings are disappointing, but it’s a good fit for its limited target audience. The LED Cinema Display is bright, environmentally conscious, and looks great next to a new MacBook.